In the field of thermoset composites, we are experts in formulations (resin mixtures and all types of additives) and in obtaining or manufacturing composites. We therefore develop and characterise ultralight, multifunctional, sustainable, fireproof, halogen-free materials capable of meeting mechanical and functional specifications. Thermoset resin-based formulations: polyester, epoxy, phenol or furan-based, etc. for application in processing thermoset composites (SMC, BMC, RTM, infusion, filament winding, pultrusion). We develop composites based on thermoset resins and fibres (glass, carbon) and on materials from renewable natural sources (natural resins and fibres). We develop prepregs using combinations of roving, mat and fabric for their transformation by compression and vacuum. 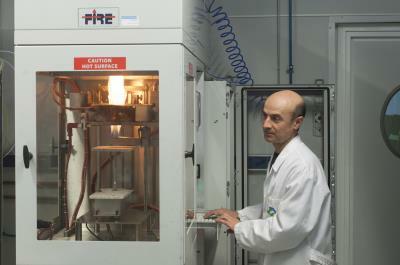 We develop formulations adapted to UV and microwave curing. Fireproofing of thermoset materials. We develop composites compliant with fire behaviour regulations in the construction and railway sectors.